Thunderbird center Zach Larsen has earned his second All-American honor following the 2018 campaign as Phil Steele’s FCS All-American Teams and All-Big Sky Teams have been released. Larsen was named to the Third Team Offense. 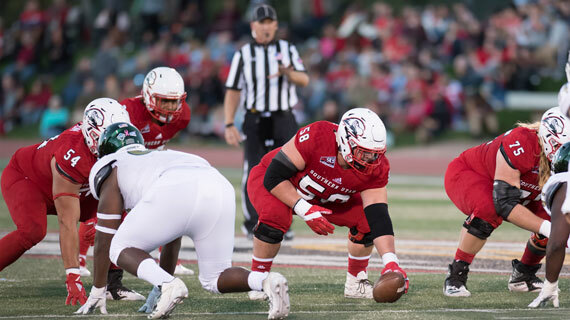 Prior to this announcement Larsen had been named to the Walter Camp FCS All-American team, after earning the title from three different publications following his sophomore season in 2017. The Phil Steele Big Sky All-Conference Team featured seven different Thunderbirds, including Larsen as a member of the First Team Offense. Marquez Tucker was named to the Second Team Offense, while Chinedu Ahanonu was named to the Second Team Defense. Kick returner Judd Cockett was named to the Special Teams Second Team after returning two kicks for a touchdown during the season. Both McCoy Hill and Austin Mikkelson were named to Phil Steele’s Third Team Offense, while Taylor Nelson earned a spot on the Third Team Defense. Southern Utah’s 2019 campaign will kickoff on August 31 in Las Vegas against UNLV.